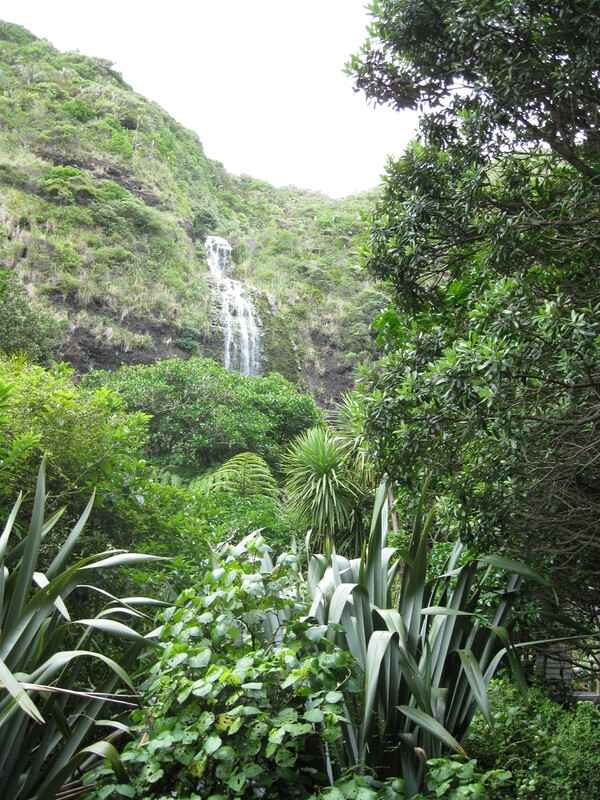 For all its wild, deserted coastline and its vast, untamed and uninterrupted bush, the Waitakere Ranges Regional Park has some picturesque and equally appealing oases of civilisation. Firstly, there’s Titirangi. Once a service town for the farmers and bushmen who worked in the region in the early days, for over half a century it has been an enclave for artists, craftspeople, writers and musicians. It is a pretty little village, with lovely and beautifully restored old buildings, from quaint colonial to sleek art deco cinema. Nestled deep in the bush between the hills, in a truly inspirational setting and blessed nowadays with some great cafes, restaurants and shops, it’s a great spot to limp into after a great day out in the bush and on the beach. Then there’s the Arataki Visitor Centre. Arataki means pathway to learning. At the centre visitors of every age can learn the story of Te Wao Nui o Tiriwa and Te Kawarau o Maki, the tangata whenua, or original people of the area. They can learn about the park’s flora and fauna, out its history and its future. Here Park staff offer help planning tours of the region and advice on how to get the best out of all it has to offer, safely. Designed by the local, Karekare architect, Harry Turbott, the building is a fine example of a modern, truly bi-cultural New Zealand architecture. It features a large pou (post) at the entrance and stunning interior whakairo (carvings). 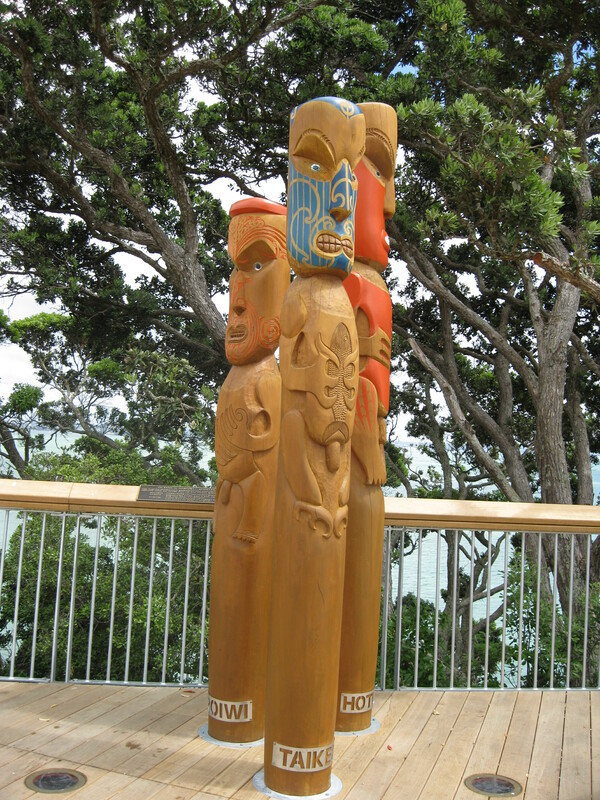 Fashioned out of two giant kauri from the surrounding forest, they depict the ancestors of Te Kawarau o Maki. The sweeping decks on the outside of the building offer panoramic views over the park and a great vantage point from which the less intrepid and capable can enjoy its vast and rugged splendor. Finally, there’s Elevation. Hidden just under the brow of one of the Waitakere’s highest hills and 361 metres above sea level, this restaurant is worth visiting for the view alone. Look back and you take in the city of sails one side to the other and the Auckland region from coast to coast – the 28 volcanoes, the flats of South Auckland, the beaches, the parks – the lot. Look ahead and you take in forest as far as the eye can see. It’s breathtaking. Elevation also serves up some really mean cuisine! The spectacular, densely-clustered, thickly forested hills of the Waitakere ranges are bordered by a stunning coastline of soaring cliffs, dramatic black sand beaches and wild surf. Turning off the main highway, we wind down a perilously narrow road. The bush crowds in on either side. Huge ponga trees fan overhead. There is no sign of civilization – no glimpse of a house between the trees, no passing car. The road flattens beneath us and the bush thins. We reach the wild, west coast at Karekare Beach. It’s a movie set land and seascape. On one side is the lonely windswept beach with its black sand and wild unruly surf, which formed the spectacular back-drop to scenes in Jane Campion’s The Piano. On the other side, steep cliffs soar skywards, their feet in thick bush. A sm of white water cascades down a strip of dark rock. 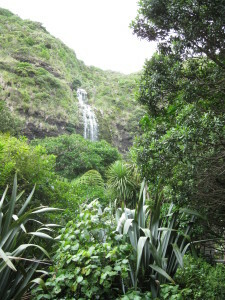 We leave the car and follow a steep narrow path through the bush to a crystal clear pool at the foot of the falls. Everything here seems larger and brighter than life; the tall pukapuka trees, with their soft broad leaves, (known to the locals as the Maori toilet paper!) the harakeke (flax) of Jurassic Park proportions. Even the delicate silver fern, our national emblem seems twice its usual size. Back in the car we press on to Piha, another star beach, this time of the TV series Surf Rescue. One of New Zealand’s best surfing spots, it is also and one of its most dangerous beaches. The wind whips the iron sand off the beach and hurls it in our faces. A cold drizzle sets in and the black cliffs look dark and gloomy. The beach is deserted. 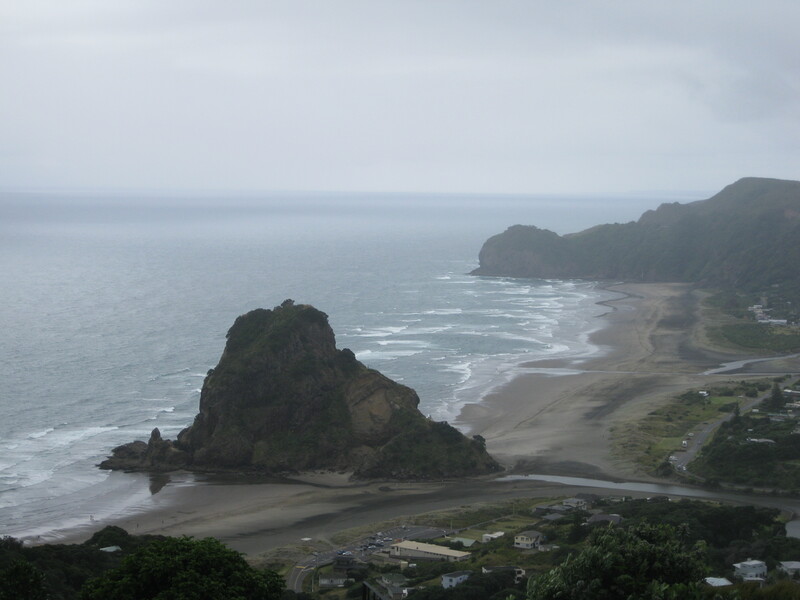 But this, our guide assures us, is when Piha is at its most beautiful and powerful. There’s a small square of weather-beaten of houses on the flat stretch of land just back from the beach. A few more cling precariously to the hillsides. It’s a wild and savagely beautiful place. There’s a feeling here that civilization is tenuous and that at any moment, nature could sweep it all away. 700 years ago, the Tangata Whenua (people of the land) Te Kawarau o Maki, hunted and gathered here in a forest rich with berries and birds and along a coastline rich with seafood. 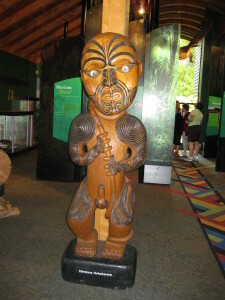 With the arrival of the pakeha, the area became the domain of farming and forestry. Dams were built to float logs downstream and mills were set up to log them. Thousands of hectares of bush were destroyed. Fortunately much of it survived. Nowadays, Te Wao Nui o Tiriwa is a giant playground, which includes more than 16,000 hectares of native rainforest and coastline. There are 250 kilometres of walking tracks, dotted with stunning, secluded spots for fishing, swimming and surfing, picnicking and camping. Within the park are some of the country’s oldest and tallest kauri trees, as well as other precious natives, like rimu and kahikatea. Indigenous birds, like pipiwhaurauroa or the shining cuckoo, tui, kereru and piwakawaka, or fantail thrive here. Te Wao nui o Tiriwa is also home to Kauri snails, pupu rangi, pepeke (Hochsetter’s frog) and pekapeka ( long-tailed bat). At dusk, titiwai or glow-worms light the bush darkness. Thanks to Operation Forest Save, a campaign by the Auckland Regional Council, large areas of bush have regenerated and larger numbers of native birds have returned. However, many pests continue to threaten the area, most particularly possums which devour 20 tonnes of vegetation in the Waitakere Ranges every night. 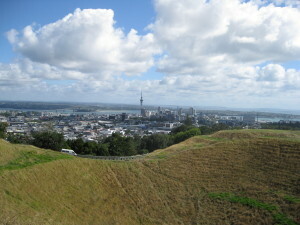 Also located in this great forest and fed by the abundant rains it attracts, are the huge reservoirs, built between 1910 and 1970, that Auckland city’s water. Many bush loving, brave and ingenious refugees from the big smoke make their homes in the Waitakere. Often, they’re harder to spot than the timid bush-dwelling birds. Letter boxes and the beginnings of driveways hint at habitation, but few rooftops break the line of the bush. By law here, you cannot displace a tree. If a tree stands where you plan to build your house, then the tree must remain and you must build around it. The bush is sacrosanct. Tamaki Drive is certainly Auckland’s, and arguably New Zealand’s, most beautiful stretch of road. On one side is a succession of lovely bays, where the sparkling blue waters of the Waitemata Harbour lap gently on golden sands. There’s Mission Bay, with its pretty park, old stone church and fountain, Kohimarama, where young mums and kids congregate on the foreshore and Ladies Bay, the nudists’ paradise. Just offshore stands the mystical island volcano Rangitoto. Its name, which means in Te Reo Maori, blood red sky, is a reference to the time of its last eruption when the sky behind it streamed with blood red lava. On the other side of Tamaki Drive lies some of New Zealand’s most highly priced and desirable real estate – high end boutiques, chic cafes, ritzy restaurants and million dollar mansions behind high security fences. Yet, among all this, some surprisingly ordinary kiwi bungalows survive, with sea-weathered paint, where togs and towels dry on the ledges of windows flung open to the sun and the breeze. Undoubtedly, the most highly prized and priceless piece of Tamaki Drive is Bastion Point. Its story is one of the determination, endurance and triumph of the Tangata whenua (local people) Ngati Whatua. In the 1970s this tract of ancient land was appropriated by the government for luxury housing developments. Ngati Whatua refused to move. There was a siege and a stand-off which lasted for years but, in the end, the government gave in. Ngati Whatua won their land back. The Bastion Point case was a watershed for Treaty of Waitangi land settlements. Since then much land appropriated by the Crown has reverted to Maori ownership. Most of the land occupied by Universites and Museums around is now owned by the people of Ngati Whatua. Bastion Point remains today, with a Marae (community centre) and some Ngati Whatua housing in one corner and a huge expanse of parkland that everyone, Aucklanders and visitors alike can enjoy. On the sea edge of the point stands the magnificent memorial to Michael Joseph Savage, the grand old man of the New Zealand Labour Party. Visitors stroll the paths bordered by flower beds and children take an illicit swim in the pond which reflects the tall stone plinth. Achilles Point marks the end of Tamaki Drive and the point itself is marked by another magnificent monument. 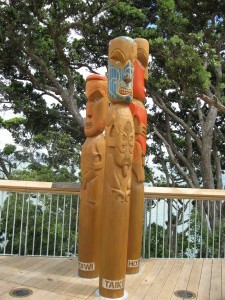 The three massive and beautifully carved Pou or pillars were the gift of the Tainui Iwi, or tribe of the region just south of Auckland. Mount Eden, or Maungakiekie, which sits in the beautiful, green acreage of Cornwall Park, is probably the most famous of Auckland’s 48 crater mountains. Until about 30 years ago it was instantly recognizable against the city skyline because of the lone pine which stood on its summit. Then, in the 1970s the pine was felled by Maori activist Mike Smith, as a symbol of Pakeha colonialism. It was a gesture which echoed his ancestor Hone Heke’s attack on the flagpole in the old colonial capital of Korareka almost a century and half before. The tree was never replaced but its stump remains as a symbol of an era of protest that pushed Aotearoa New Zealand to re-examine and begin to consider the terms of its founding document, the Treaty Waitangi. There remains another symbol on Maungakiekie, as impressive as it is significant. The John Logan Campbell memorial commemorates the man who bequeathed Cornwall Park and Maungkiekie to the people of Auckland. At the foot of the tall plinth is a small plaque to Logan Campbell. Above it towers a Maori chief in a traditional korowai or cloak. The monument is an enduring symbol of the enormous mutual respect of Logan Campbell and the Maori people and of the partnership between them. Since ancient times, Maori have gathered on Maungakiekie to welcome the constellation called Matariki which appears in the sky in mid-winter, signalling the New Year in the Maramatanga or Maori calendar. Nowadays, the Matariki draws both Maori and Pakeha New Zealanders together for this unique celebration. Maungakiekie’s fame was taken to the world by the U2 hit song written in memory of a Maori member of their crew, which speaks of One Tree Hill and the volcanic island Rangitoto, or blood red sky, which lies in the sea below . 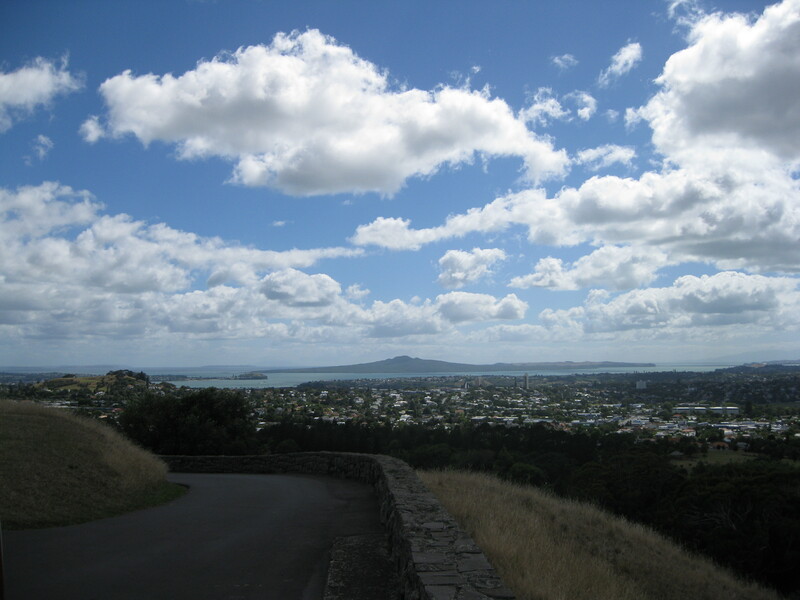 Now visitors from every corner of the globe seek out and make their pilgrimage to One Tree Hill where they look out across the sea to Rangitoto. 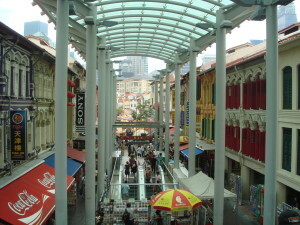 Singaporeans often joke that shopping is their national sport. With more malls and stalls than pitches and courts and with shops and stores a popular playground for Singaporeans during every tiny window of leisure time, this is easy to believe. But joking aside, and Singaporeans aside too, the tiny island state is the serious international shoppers’ paradise. Millions of tourists pour through every year, stopping over for a couple of days, or shuttling in from Changi Airport for a few brief hours of retail therapy in Singapore’s 150 fabulous international shopping malls and in its scores of ethnic markets and bazaars. Probably the best known and the busiest of Singapore’s shopping streets is Orchard Road It also has the highest concentration of international super-centres, among them Wisma Atria, home to the Japanese department sensation Isetan; Centre Point, boasting “sophisticated buys to sporty buys, all time favourites, to the hottest trends off the cat-walks”; time-swallowing Indochine with its convenient bored-man-sitting bar, The Sanctuary; Palais Renaissance, palace of grand marques like DKNY, Etro and Gianni Versace; exotic Far East Plaza; Ngee Ann City with a host of big brand boutiques as well as the brilliant Kinokuniya Bookstore. Last but certainly not least among Orchard Road’s top shops is the wonderful old Singapore institution, Tang’s, in business here since 1932. For the Marketeer, the bargain hunter, the shopper who has seen the $1000 European designer bag of his/her dreams and seeks its $10 Asian clone, or for those in quest of authentic local treasures, Singapore has a wealth of fascinating bazaars and markets. Bugis Street Bazaar is one of the best. Once the haunt of flamboyant transvestites and famed for its vibrant night scene, it still pulses with life and colour, day and night. Side by side with hawker food stalls, tiny boutiques sell souvenirs of every kind, from incense to indigenous art, designer knock-off bags, shoes and clothes, ethnic Indian, Chinese and Malay outfits as well truly extraordinary creations from bold young local designers. Tucked away in corners are little shrines with fresh offerings of incense, oranges, sweets and garlands of flowers. Chinatown, south of the river, Little India, beyond Bukit Timah Road in the North West and Kampong Glam in the North east are also rich in bargains, souvenirs of every kind, along with the latest in electronic and digital wizardry. But their real shopping prizes are in their ethnic treasures. In Chinatown you’ll find cheong sams, embroidered slippers and bags, tea sets and tableware. In Little India there are exquisite hand-woven Saris, beautiful brassware, carved wooden furniture, embroidered bed-covers and tablecloths. Kampong Glam has basketry from Borneo, Indonesian wall-hangings, Middle Eastern carpets and silks, exquisite traditional Malay and Peranakan garments as well as antiques from all over the Malay Archepelago. 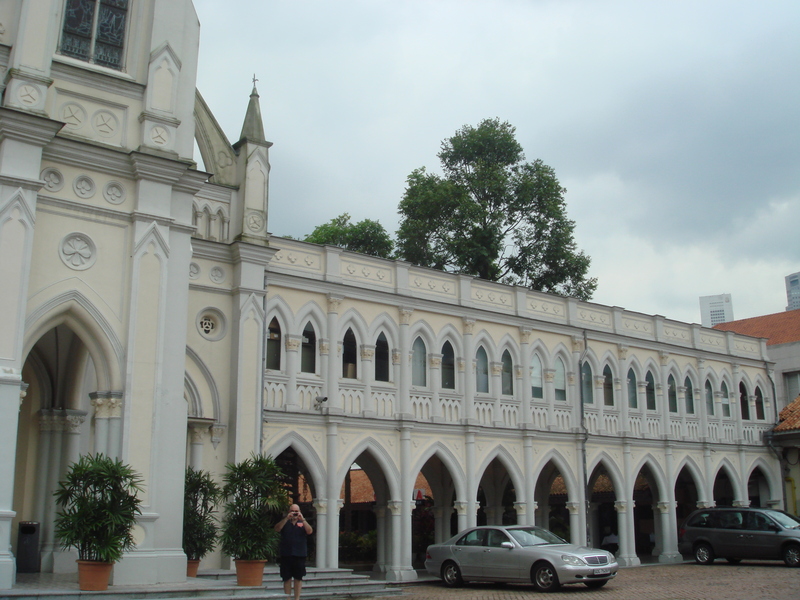 Then, last but not least Kamping Glam’s Arab Street is one of the last of the world’s great fabric centres. Shopping is not just plentiful it’s painless in Singapore too – no racing to meet closing-time curfews, no parcel-laden, cross-city steeple-chases, there’s always somewhere open to trade, just nearby, or ridiculously easily accessible by MRT. From some hotels, like those down in Marina Bay which connect to the fabulous Suntec City Mall, City Link Mall and Marina Square by skywalk, there’s no need even to tread Singaporean soil to shop. In others, like Raffles, with its own exclusive cluster of exquisite boutiques, selling Jim Thompson Silks, designer jewellery, teas and accoutrements, accessories and designer threads, high-class collectibles and souvenirs of the house, there’s really no need to step outside at all. In its last life Chimes was the Convent of the Sisters of the Infant Jesus, dedicated to the education of young Catholic ladies. Some years ago the Convent closed and was reborn as a centre of pleasure and leisure. 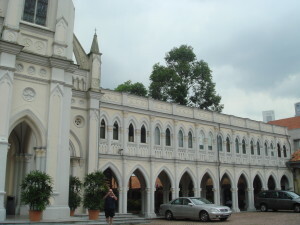 The former chapel is a now a chic reception centre. The cloisters are taken up with souvenir shops, restaurants and cafes. The courtyards and lawns are given over to outdoor dining areas. The classrooms have become clubs, discos and bars which boom with house music and bands. 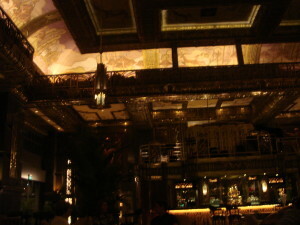 This is the place to end a Singapore night, with a romantic dinner in one of those courtyard restaurants, then dancing out the demons until dawn in one of the discos or nightclubs. The Divine Wine Society Bar, in the lobby of ultra-modern Parkview Square, offers a completely different and totally 21st century experience. Sunk in deep leather armchairs we drank in the grandeur of the place; the lofty vaulted ceiling, the screened gallery with the grand piano, the art deco bronze balconies, thick with decoration; the art nouveau murals and frescos where formations of stylized deer on the hoof and streamlined birds on the wing speed through groves of fantastical trees; the mighty-temple pillars in bleached-stone white; the carpet like a deep, pink rolling cloud; the towering three storey wine chiller, silhouetted with thousands of supine bottles. An angel, in diaphanous white, with glittering wings and halo, floated silently across on ethereal ballet-slippered feet, with a gold-emblazoned drinks list of biblical proportions, to take our order. We watched in wonder as she soared on the end of a wire, higher and higher, buzzing backwards and forwards, up to the very top shelf of the giant fridge, in quest of our champagne. Had she been accompanied by celestial choirs, rather than a piercing mechanical whine, we might well have believed that we had died and gone to heaven. Clean, green, well-behaved and law-abiding it may be, but Singapore is far from lifeless and Singaporeans are far from dull. The city has a plethora of bars, clubs, pubs and party places where its people love to let their hair down and live it up. 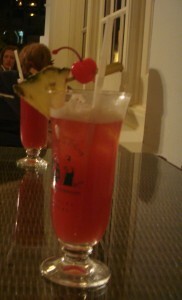 Most famous of Singapore’s watering holes is the Long Bar at Raffles Hotel. It is a slice of old Singapore; all polished teak tables, green lamps, wooden beams, heavy ceiling fans and worn brass, with narrow French doors opening onto wide verandahs and with the long curved bar which gives it its name, as its focal point. Steeped in a century and half of history, it whispers with stories of times past and of old colonial characters long gone. The traditions of the Long Bar, however, are very much alive and dutifully observed by the steady stream of visitors who flock to it, like pilgrims to a shrine. 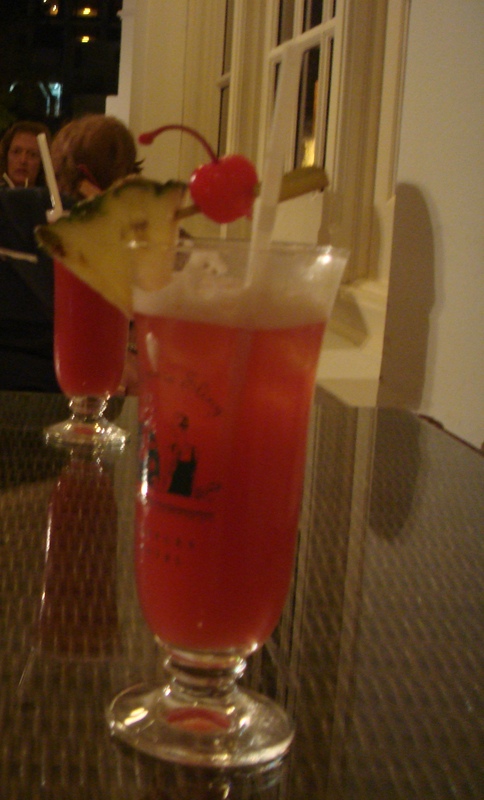 The Singapore Sling, invented here almost a century ago by barman Ngiam Tong Boon and whipped up now by the fridge full, is almost a holy obligation. The potent pink pineapple-coconut-cream-tasting concoction is ritually sipped, accompanied by peanuts in their shells, which are, according to custom, dropped on the floor and crunched underfoot. Still, is something lost in the loudly marveling voices, the ankle socks with sandals, the pantacourts and the tank tops of today’s Long Bar, we wondered? And we found ourselves thinking wistfully of white linen, panamas and voile, with the occasional crisp comment tossed from behind the Straits Times.